The Farm Forestry Association, and Scion have been collaborating for the last 5 years on a project to get a new biological control agent into New Zealand to control the damaging spring generation of the Australian eucalyptus tortoise beetle, Paropsis charybdis. Funded by MPI Sustainable Farming Fund, Scion SSIF core funding and commercial companies South Wood exports and Oji Fibre Solutions Ltd, we are finally ready to proceed to the EPA (Environmental Protection Authority). Biological control, known also as biocontrol, exploits a naturally occurring process in which a natural enemy of a target pest is introduced to an area from which it is absent, to give long-term control of the target pest. In the case of the target pest Paropsis charybdis, four potential agents have been introduced already in previous decades. Only two of these have been helpful, and a more effective control is needed. The agent that can target the feeding larval life stage is the Australian native parasitoid Eadya daenerys (Hymenoptera: Braconidae). (This was investigated under the name Eadya paropsidis but a name change has now been advised by specialists. Scion has been conducting laboratory host-range safety tests with female parasitoids each summer for the last four years. Previously this species has only ever been reared from eucalypt-feeding Paropsis and Paropsisterna tortoise beetles in Tasmania. Tests were conducted against the target pest Paropsis charybdis and also against other closely-related beetle species found in New Zealand that Eadya daenerys may never have contacted before. Beetles were selected for host range testing based on how closely related they were to Paropsis. Paropsis charybdis is a leaf beetle in the family Chrysomelidae. More specifically, tortoise beetles belong to the subfamily Chrysomelinae and within that, the tribe Chrysomelini (Table 1). Galerucinae beetles are also closely related so these two subfamilies were examined. Many species do not feed on leaves or at the right time of the year. For instance, no native Galerucinae beetle species feed on leaves, but rather live within the soil on plant roots. Whereas Eadya hunts for beetle larvae on the leaves of trees, will never encounter a larva in the soil. four more distantly related weed biological control agent beetles the heather beetle, Lochmaea suturalis, the alligator weed leaf beetle, Agasicles hygrophila, the green thistle leaf beetle, Cassida rubiginosa, and the tradescantia leaf beetle, Neolema ogloblini. To be at risk of exposure to Eadya daenerys, larvae of non-target beetles need to feed externally during the daytime on the leaves of their host plants for at least a portion of their lifecycle. They would also need to do this in springtime (November-December) when Eadya daenerys adults will be active. Therefore in total Scion tested nine non-target species, while always using Paropsis as the control pest species for comparison. Eadya daenerys is a promising parasitoid because it attacks beetles. Rather than attacking the eggs of a pest (which make it unlikely to have a substantial long-term effect on controlling Paropsis populations, it attacks the larval life stage. Eadya has a one-year life-cycle, with adults present only in spring. 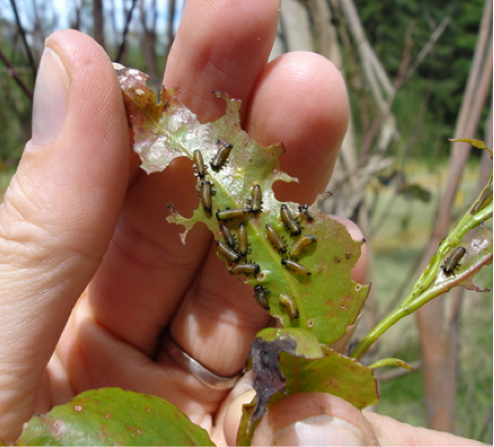 At this time, in Tasmania, there is an abundance of young larvae of Pst. agricola which the Eadya feed upon. This food supply is not available in New Zealand but the eucalyptus tortoise beetle is. The role of the adult is to lay an egg in the beetle larva - that larva then eats the inside out of its host. When it has reached maturity it pops out of the larva, leaving just a skin behind. It spins a silken cocoon in the soil where it hibernates for the rest of the year before emerging as an adult to locate a mate and reproduce itself, the following spring. No-choice tests are considered to be the most thorough type of test that will reveal any possible harm to non-targets. This is because they force the parasitoid to make contact with non-target larvae by giving them no choice of anything else, and by holding the species together for a long time without the parasitoid being able to escape. One female Eadya daenerys was introduced into a cage at a time and then left undisturbed together for exactly 24 hours, after which time the parasitoid was removed and the larvae were reared to a beetle pupa stage. If they died they were dissected to see if the parasitoid was developing within them. With the target pest, our results indicated that when not attacked by Eadya daenerys, Paropsis had a survival success to pupation of 80. When attacked purposefully by Eadya sp. (one sting observed into each larva) the survival rate drop to less than 10%. This demonstrates the effectiveness of the parasitoid at causing additional mortality to the pest and is why we hope it will be safe to release in New Zealand. For the non-target beetles, about two-thirds of the beetle larvae in each replicate successfully survived to pupate, with an average of 5 out of 8. The best rearing survival was achieved on the non-targets: the native veronica leaf beetle Allocharis (90%), the broom leaf beetle Gonioctena (85%) and tradescantia leaf beetle Neolema (85%). The worst rearing success to pupation of just 40% was achieved on the tutsan leaf beetle Chrysolina. Apart from the target host P. charybdis, Eadya daenerys parasitoids only completed development, and emerged as a fully developed adult wasp, from one non-target species, the small tortoise beetle pest Trachymela sloanei. Three of the five emergent parasitoid larvae from T. sloanei spun cocoons, with one cocoon producing an adult Eadya after overwintering. This confirms Eadya as a host (= development from egg to adult within a species). 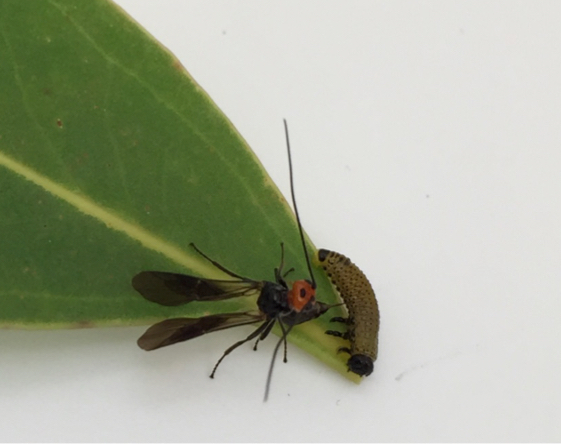 The only other evidence of attempted parasitism by Eadya daenerys parasitoids was discovered by dissecting dead non-target larvae, or by killing and dissecting mature larvae that had failed to pupate. Internal parasitism was found in four non-target species, all from the subfamily Chrysomelinae: the blackwood tortoise beetle pest Dicranosterna, the native veronica leaf beetle Allocharis, the tutsan leaf beetle Chrysolina and the broom leaf beetle Gonioctena. This is referred to as being an “unsuitable physiological host” (= unable to complete development all the way from egg to adult within a species). 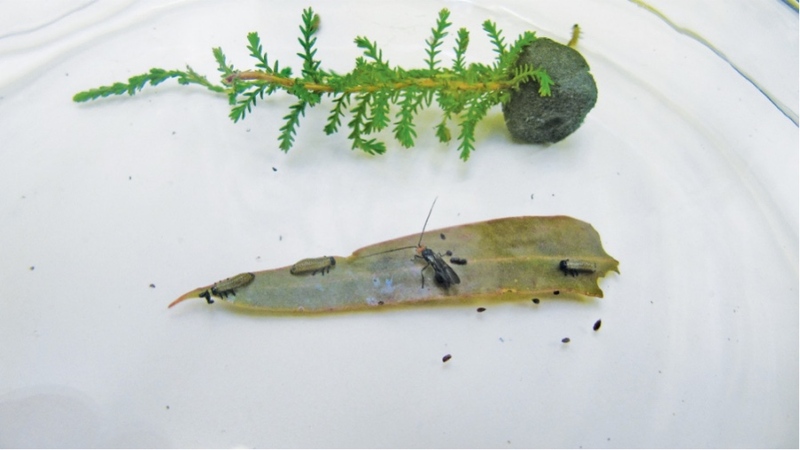 The behaviour of the Eadya parasitoid was observed closely under two experimental test conditions: sequential no-choice tests and two-choice tests. A significant difference in Eadya attack behaviour towards Paropsis larvae compared to each of the paired non-target larvae occurred in all except for the paired Paropsis-Trachymela no-choice test. This can be seen in the box-and-whisker plots (Figure 1) which show a clear overlap of boxes only for the Paropsis-Trachymela pair and little or no overlap for the other species pairings. The median number of attacks for the Paropsis-Trachymela pair was 2.5 for Paropsis and 1.5 for Trachymela while that for each other paired non-target larvae was identically zero attacks, while those towards Paropsis larvae in the grey bars was between 2 to 10 attacks in the same time. Figure 1. 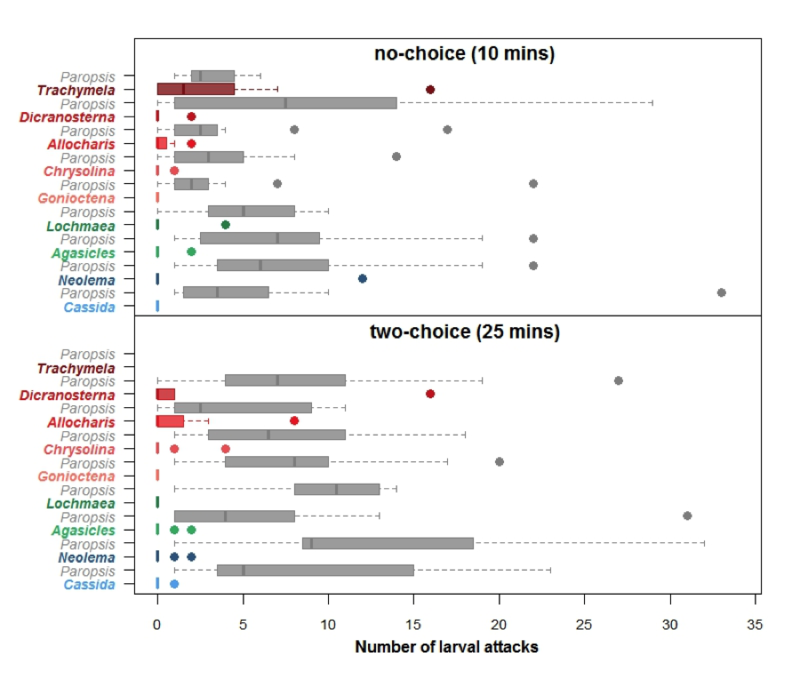 Box and whisker plots representing total number of successful attacks counted by each Eadya daenerys parasitoid in no-choice sequential (10 mins) and two-choice tests (25 mins). The P. charybdis target larvae paired against each non-target larval species are shown in grey. The bold line on each represents the median value, the box represents the interquartile range and the dots are extreme outliers. To determine the likelihood of attack on non-targets in the confines of these artificial experimental arenas, it is necessary to understand what proportion of observed Eadya females were responsible for the attack behaviour that is summarised above in Figure 1. Interestingly between all the non-targets tested it was more common for a female Eadya to attack a blackwood tortoise beetle Dicranosterna larva, than a tutsan leaf beetle Chrysolina larva, particularly under two-choice test conditions (Figure 2). However, the highest proportion of Eadya females exhibiting attacking behaviours towards non-target species was associated with Trachymela in the no-choice test. Most importantly however the proportion of females attacking Paropsis in these paired assays was always 100% as this was the normal criteria for inclusion of the data!. Figure 2. Visual representation of the proportion of tested female Eadya daenerys that were observed to attack non-target larvae in the two types of behavioural assays. The potential new parasitoid Eadya daenerys development through its life cycle only on species in the tribe Chrysomelini beetles i.e. Paropsis 80%, and in the other eucalyptus pest Trachymela sloanei at 12% success. Incomplete physiological development, (death of the parasitoid) was discovered upon dissecting the bodies of four non-target species of Chrysomelinae: in the native sub-alpine veronica leaf beetle Allocharis (internal parasitism at 8%), in the tutsan leaf beetle Chrysolina (internal parasitism at 2%), in the broom leaf beetle Gonioctena (internal parasitism at 5%) and in the blackwood tortoise beetle pest Dicranosterna (at 2%). Behavioural assays with female Eadya daenerys artificially confined with larvae resulted in occasional attacks against almost all non-targets (but interestingly never against broom leaf beetle). The stimulation to attack was highly significantly less towards all non-target species compared to Paropsis and is likely to be due to the confines of the testing environment. The ability of Eadya daenerys to internally parasitise the broom and tutsan leaf beetle larvae is likely to equate to minimal or nil impact in the field. This is because attraction to these larvae in behavioural assays was highly significantly less than that towards target larvae. Eadya daenerys females will actively search for paropsine larvae to attack on eucalypt foliage. But we cannot completely rule out that occasionally some individual non-target beneficial beetles may be stung, even though no parasitoids can develop through in them. Similarly the odd attack may occur on the blackwood tortoise beetle, but as this is an exotic pest beetle this will not be of significant impact. Eadya will never complete a life cycle on the veronica leaf beetle but the internal parasitism of the veronica leaf beetle Allocharis may cause some to worry. This beetle has only ever been collected between 1100m-1300m asl in Kahurangi National Park. There are no eucalypts growing in this national park, although they exist in Golden Bay river valleys. It is unlikely that Eadya will ever disperse up into these native subalpine forest habitats. In Tasmania Eadya has been collected at 600m asl , the highest altitude where E. nitens has been commercially planted there, and paropsine hosts were abundant at that site. Unfortunately we were unable to locate any of the other dozen or so native sub-alpine beetle species that are medium sized and may have leaf-feeding larvae. Bearing all these uncertainties in mind, we consider there is minimal risk to native beetles in New Zealand from Eadya. Scion would like to hear from Farm Foresters, especially your views on the benefits or risks of proceeding with this introduction to try and secure better biological control of Paropsis. You can click here to fill out a short form and have your views captured.